Windows 10 S is a special mode in which the Windows 10 operating system runs that can make your PC more secure and stable to use, but what is it and why might you want it? Essentially Windows 10 S is the equivalent of Google Android or iOS on the PC, in that it can only load and run apps and software from the Microsoft Store, or the Store for Business. This means that no win32 desktop apps, the software we’ve been installing on PCs for decades, will install or work. You might consider this a deal-breaker, but for some people running Windows 10 in S Mode can help reassure you that some vulnerable or inexperienced PC users, such as elderly parents, children, or the disabled, can have a happy and pain free time on their PC. S Mode will also prevent malware from being installed on the PC, making it significantly more secure. Many laptops and ultrabooks come with S Mode pre-enabled, such as the Microsoft Surface Go, but they let you switch to Windows 10 Home or Pro if you require full win32 desktop programs. If you already use Microsoft Store apps though, or win32 apps that have been packaged for delivery through the store, such as Microsoft Office 365, then you might never notice the difference between full Windows 10 and S Mode. 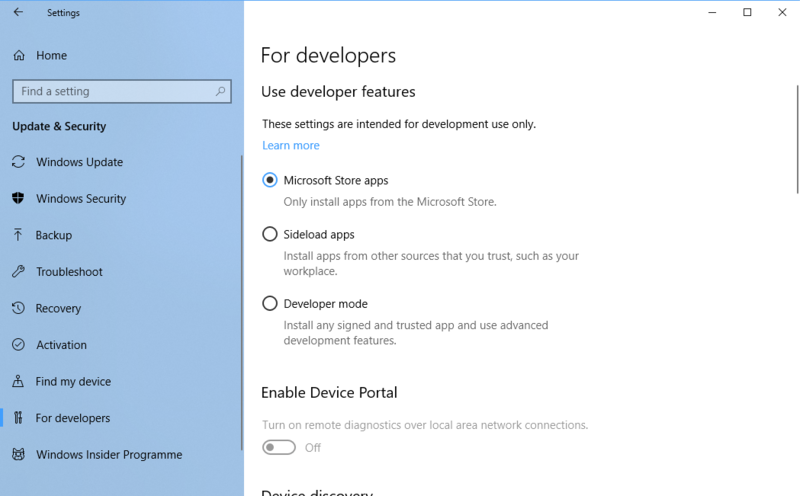 If you think Windows 10 in S Mode might be good for you, a friend, or a family member you can activate it on any Windows 10 by opening Settings > Update & Security > For developers and changing the use developer features option to Microsoft Store apps. This will prevent any win32 software from installing, which will also prevent malware from infecting the PC and make it much more secure. It’s likely that Microsoft will add a full “Switch to S Mode” option in a future update to Windows 10, and I’ll update this article as and when this happens. You can read mode about S Mode on the Microsoft website.